The folder names are equal in all MVC applications. The MVC framework is based on default naming. Controllers are in the Controllers folder, Views are in the Views folder, and Models are in the Models folder. You don't have to use the folder names in your application code. Standard naming reduces the amount of code, and makes it easier for developers to understand MVC projects. The App_Data folder is for storing application data. We will add an SQL database to the App_Data folder, later in this tutorial. The Content folder is used for static files like style sheets (css files), icons and images. Visual Web Developer automatically adds a themes folder to the Content folder. The themes folder is filled with jQuery styles and pictures. In this project you can delete the themes folder. Visual Web Developer also adds a standard style sheet file to the project: the file Site.css in the content folder. The style sheet file is the file to edit when you want to change the style of the application. We will edit the style sheet file (Site.css) file in the next chapter of this tutorial. MVC requires the name of all controller files to end with "Controller". We will create more controllers later in this tutorial. The Models folder contains the classes that represent the application models. Models hold and manipulate application data. We will create models (classes) in a later chapter of this tutorial. 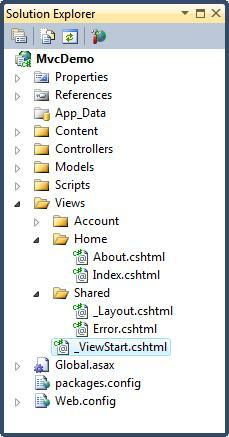 The Views folder stores the HTML files related to the display of the application (the user interfaces). We will edit the layout files in the next chapter of this tutorial.